I've always loved nice old things and early on I collected the odd set of old pillowcases. My total obsession with vintage linens was born when I inherited my grandma's collection in 2000 when she went to a nursing home. She still had the monogrammed pillowcases she made as a young girl to fill her hope chest and the ones she received as wedding gifts in 1930. She also had beautiful unused table cloths and hand crocheted blankets. 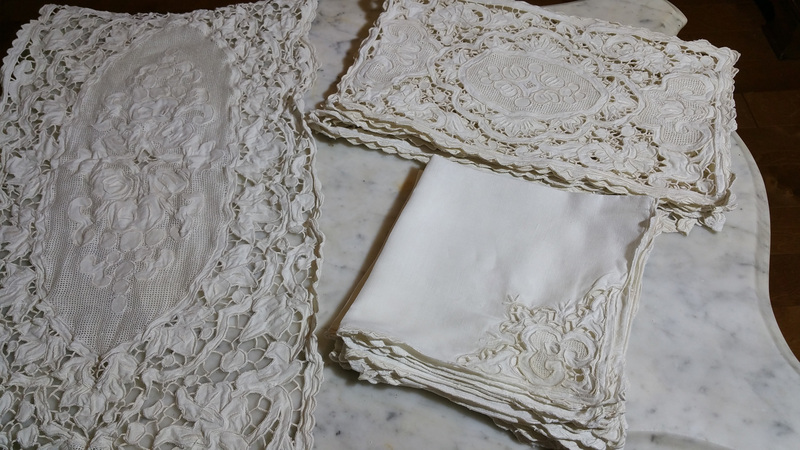 Vintage linens are a valuable heirloom. Linen was once prized for its longer fibers that were about 12" long, which gave it special qualities like longevity, smoothness and shimmer. Linens was stiff when new and over time - and with many washings - linen became softer and even smoother. Today’s linen is different. The long linen fibers, which were once the prize of Ireland, Finland, France, and Belgium, are now processed in China. Because the processing of linen in the Old Way is labor intensive and expensive due to its very long fibers, the new linen fibers have been cut to the same short length as wool fibers at 4 to 5 inches length. Thus new linen is no longer as smooth as vintage linens. The new linen has lost its durability, as well. So why not save big money and buy vintage linens that are made with such greater quality! See our complete selection of VINTAGE LINENS.